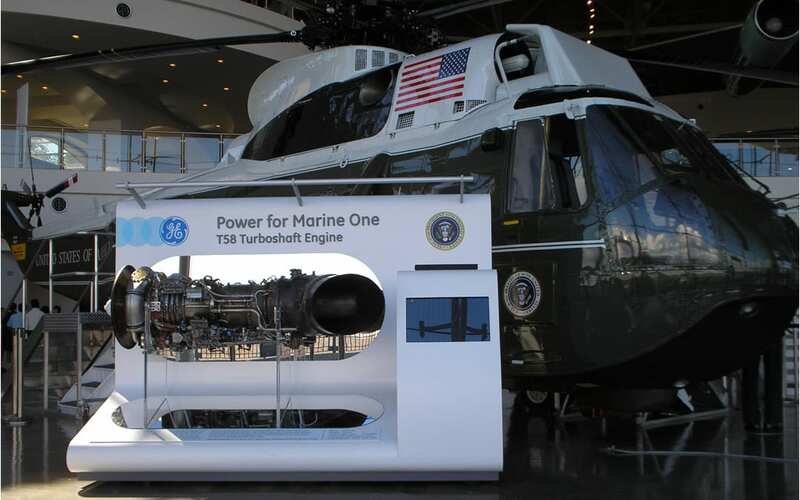 Attendees recently participating in the National Defense Forum at The Ronald Reagan Presidential Library in Simi Valley, California were greeted by a sparkling new Marine One T58 Engine exhibit chronicling six decades of GE power for the Presidential Fleet. The exhibit was developed and donated to the Library by GE for public education. Held annually, the Reagan National Defense Forum congregates leaders across the defense community to address the health of national defense and stimulate policy discussions that can bolster the U.S. military. Other attendees included senior leaders from the Office of the Secretary of Defense, Congress and industry. Among the attendees at the event to witness the debut was Jean Lydon-Rodgers, Vice President and General Manager, for GE Aviation’s Military Systems Operation. The Library is home to President Reagan’s primary aircraft, VC-137 (SAM 27000) Air Force One and a Sikorsky VH-3A Marine One helicopter from the President Johnson era. The VH-3A and the VH-3D fleet are powered by the GE T58 engine. Today’s VH-3Ds use the T58-GE-400 and are the same aircraft that served President Reagan for more that 1,400 lifts to 27 countries during his term. GE traces its proud legacy of Presidential power to the early 1960s, when T58 engines served ten Presidents from Kennedy through Obama. In 1990, the CF6-80C2 joined the fleet, powering the Boeing VC-25A and providing lift for President H.W. Bush through today. The history and heritage of service to our Presidents is poised to continue! A new Air Force One Boeing 747-8 powered by GEnx-2B engines is slated for service entry in 2019, followed closely by Sikorsky VH-92A helicopters featuring two CT7-8A6 turboshaft engines in the 2020 time frame. “GE is proud and privileged to have our customer’s confidence by selecting our engines to carry the President in the past, present and into the future,” said Lodge. Discover more about GE Aviation’s history of powering the world’s aircraft, featuring more than 90 years of innovation. I did not realize GE had powered the Presidential fleet for six decades! One of the many reasons I am truly proud of being a GE employee.